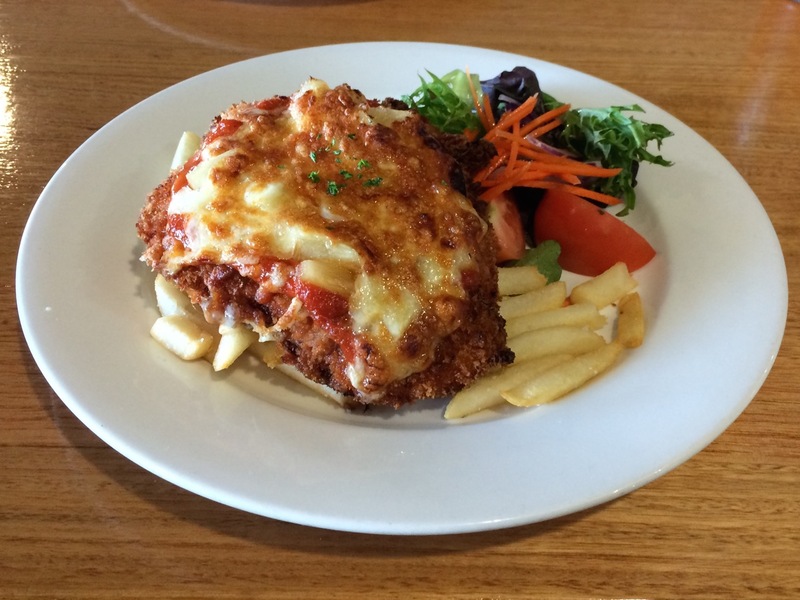 Crumbed Chicken Breast Schnitzel topped with Tomato Napoli, Virginian Ham, Pineapple and melted Mozzarella Cheese. So we toddled off to enjoy a cheap parmi all the while though, I was thinking “You get what you pay for”. However, I must say in this case, a cheap parmi was certainly not what we got. 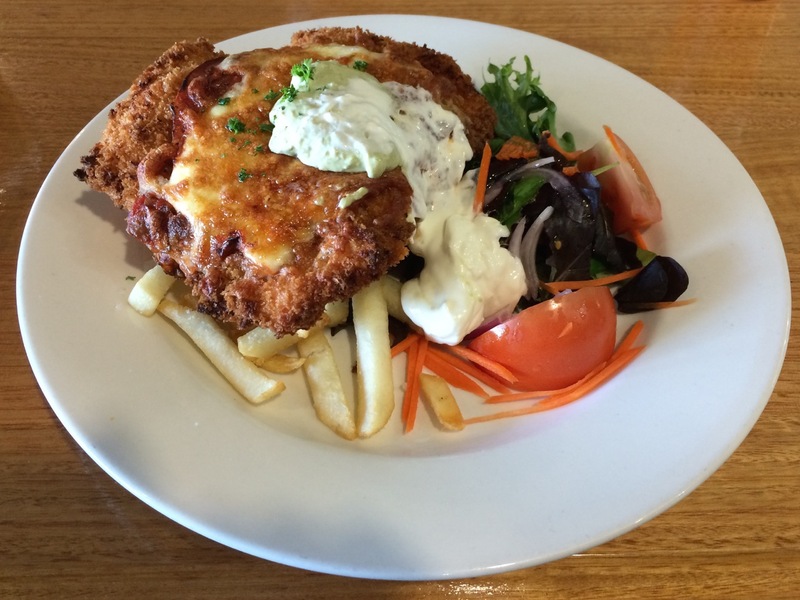 I noticed on the regular menu that the Traditional Chicken Parma is $22 and cannot for the life of me see how what we received for $15 could or would be anything less than a chicken parmigiana ordered any other night of the week. Put simply, it was fantastic and being the $15 Chicken Parmi Night, there were five different sauces to choose from: Traditional, Hawaiian, Sicilian, Mexican, and Prawn and Scallop. I do love a good Hawaiian Pizza (and have been making some awesome ones on our Baby Q), so it was hard for me to pass up on blending ‘Hawaiian’ flavour with a parmigiana. The schnitzel was all breast, but the meat was a little dry, if only a little. The schnitzel itself was large, not as big as the one I was served at The Fox thank goodness, but bigger than the one I had at The Entrance Hotel. All the same though it was tasty, the crumb crisp and crunchy, not burnt (despite the colour in the photo), and I guess I must have been really hungry, because I ate all of it. Ok, I was really hungry after an entire day out exploring St Helens and surrounds. The sauce was pretty standard, actually lacking a little punch, but the inclusion of the pineapple more than adequately made up for that. The slice of ham had nothing to do with the Hawaiian aspect of the meal as it is normally included (according to the regular menu) and having it below the cheese was neither here nor there. The amount of ham was neither too much nor too little and I think the meal would have been just as nice without it. There was the perfect amount of cheese on top of the sauce. It was melted to perfection with a crust of golden (slightly) crunchy goodness. Finally, after four months, a parmigiana that was not covered with sloppy melted mozzarella oozing oil onto the plate. The salad was very ordinary with only lettuce, tomato, a few strips of carrot and red onion. There was nothing else with the exception of a squirt of dressing and the only thing that let the meal down. The chips were spot on. Fresh, crispy, and (believe it or not) there was not too many of them. Some establishments overload the plate with chips, but this was not the case. I must say though that I took the chicken off the chips before I started eating and perhaps had I not done so the chips may have been spoilt. I gave this Chicken Parmigiana 8.6/10 overall because even though the meat was dry, the salad was sad and the sauce lacked punch, these were completely overshadowed by everything else. Even though the place was crowded, we thought we were served within a reasonable amount of time and the food was hot. The crispy crumb, the right amount of cheese perfectly melted, and the fresh crispy chips. For $15, dinner was wonderful and we will be going back to the Bayside Inn again on a Thursday night before we leave St Helens so I can try another (different) parmigiana. Don’t forget to check out where this Chicken Parmigiana sits on My Parmigiana Richter Scale. By comparison, his Dean’s meal was much larger than mine. His plate had more chicken, more chips, more salad, and all I can say is that someone in the kitchen must have known a man ordered the Mexican Parmi. I was not jealous, I was very glad that my plate didn’t contain so much food and must say that Dean enjoyed his meal and ate every bite of it. This was one of those rare occasions where I didn’t have leftovers that Dean simply had to finish as is normally the case. I don’t think he would have been able to anyway.